First select what you want / need to export. If it's just one sequence, select that, either in the browser, or by making its open timeline active. If it's a bin of clips, select that. If it's your whole project, make the browser active, and make sure nothing in it is selected. When the Export XML window opens, you'll see that it gives you a summary of what you've selected. Then it gives you an option for the XML format you wish to use. There's a choice between Apple XML Interchange Format, version 1, and Apple XML Interchange Format, version 2, with Version 2 being the default. 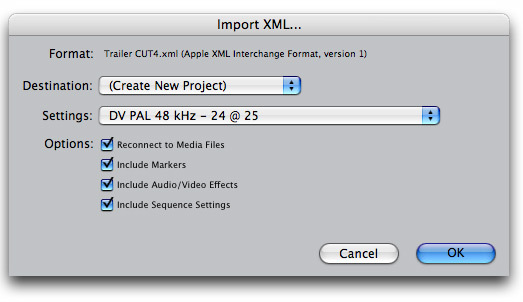 FCP 4.5 only deals with version 1, so to export your FC5 project for FCP4.5, choose Version 1. That's greyed out in my first example, as I had selected the entire Project, so there are no master clips outside of my selection. 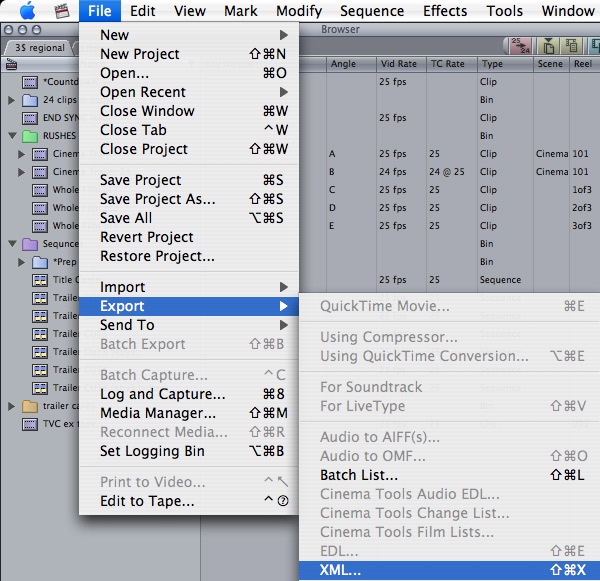 You might use this option if you only selected a sequence for export, and thought you might as well get all the rushes along with it. The source summary will update to reflect your new selection. Hit OK and save your XML file. It will adopt the name of your selected bin, sequence, or project. Re-name it if you need too. As you can see, the file looks like most FCP files. So I added the .xml extension on saving, to make locating it easier. As you can also see, I was up late last night. OK, now to open the project in FCP4.5. Again, it's just how you think it would be..
Navigate to the saved xml file, and choose it. it means you've accidentally made a version 2 xml file, and have to export another one. 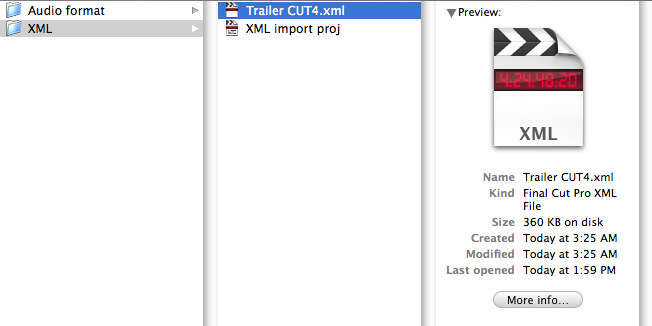 As you can see, in FCP4.5 you have no options on the import format. The Settings pulldown allows you to specify your sequence settings, and is set to whatever is your current pre-set. 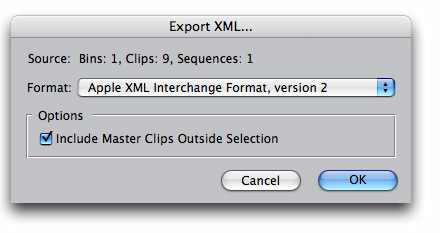 Even though your exported sequence did have its own settings, you should set this to match. Frame-rate, codec and aspect ratio cant be changed, but it seems that pixel aspect and filed order can, so best to get them right. But the main reason you'd want to specify new sequence settings can be gleaned from the following options. They're all fairly self-explanatory, and they are all set to on by default. AND un-tick the "Include Sequence Settings" option. As you can see, I've also un-checked "Reconnect to Media Files" as I'd want to do that manually, or re-capture. Hit OK, and the import starts. But they're non-critical errors, so don't panic, and hit Yes, to see the log. These errors might be because I had high quality rendering turned on in my FCP5 sequence. I wanted to see what sort of issues would be thrown up, but it seems like they're not a problem at all. Everything is where it should be, and my effects are all in place. The only real difference is that in FCP4.5, I have less RT. Those with eagle eyes will see some very minor discrepancies in the transitions, but it's only a display issue, and they played exactly as intended. Stereo clips are fine for travelling backwards. 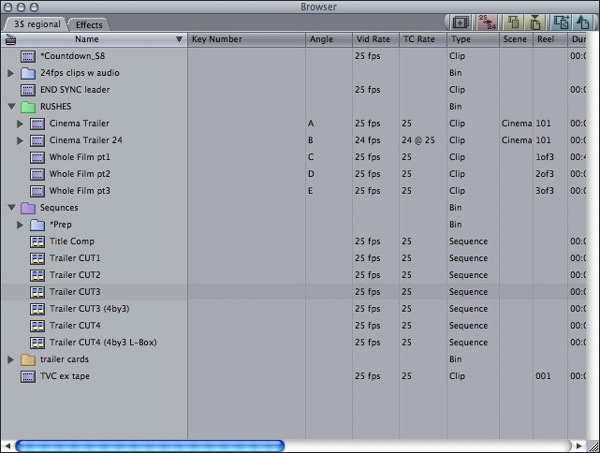 But if you capture audio in FCP5, as Ch1+Ch2, and try to use those clips in FCP4, weirdness can ensue! XML imported browser clips will only have ONE "mono mix" audio track. 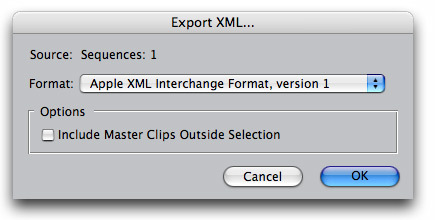 XML imported clips in the timeline will LOOK like they have both tracks, but you only hear one of them. And if you match-frame from them, they appear in the viewer with only one mono track. If you have to work like this, and you can get by with the audio formatted as mono mix like that, you can. 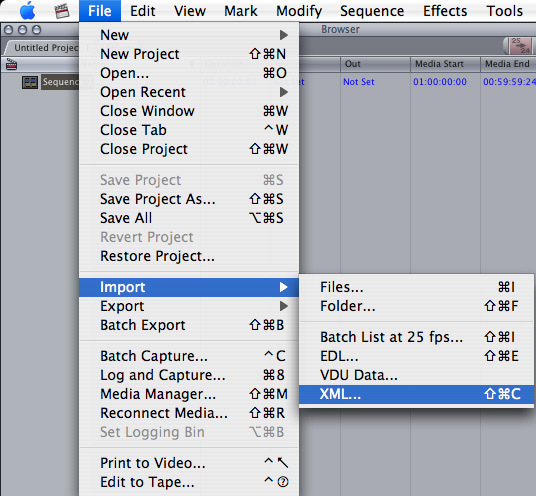 You can rescue the audio by re-opening your project in FCP5, and STAYING THERE. The missing tracks don't come back straight away. Once the audio has been re-formatted to one track in an FCP4.5 timeline, it stays that way when the project is opened in FCP5. That's just the clip on the timeline, of course. The file still has both tracks of audio in it. F10 to overwrite back into the timeline. Your playhead winds up at the head of the next clip ready for you to do it all over. Keep going till you've done the lot. If all your cuts are level sync, you can do picture and sound at the same time, and you'll wind up with linked pic/sound clips. If you've got a lot of split edits, then turn off all pic tracks, or lock them all, and just do sound. Anyway, the track that comes back is OFFLINE, or looks that way. You can reconnect, and all is now there. Alternatively, you can reconnect in the browser, and then do the f + F10 trick. 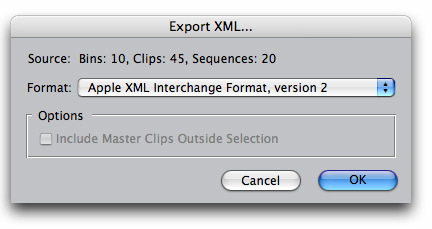 I wont pretend to know much about XML, or FCP's particular form of it. The Log report, for instance didn't mean much to me. This didn't stop me from easily taking my FCP5 project back to FCP4, and for those who are interested, there is a chapter in the FCP manual that goes into detail about how to read an XML file, and useful ways of modifying it. He won an Australian Film Critics Award and IF Award for editing THE BANK, and gained an AFI nomination for editing his first feature THE BOYS in 1998. In 2004 he edited the film THREE DOLLARS, staring David Wenham, Frances O'Conner, and Sarah Wynter, which at the time was the biggest budgeted feature film cut on Final Cut Pro in Australia.